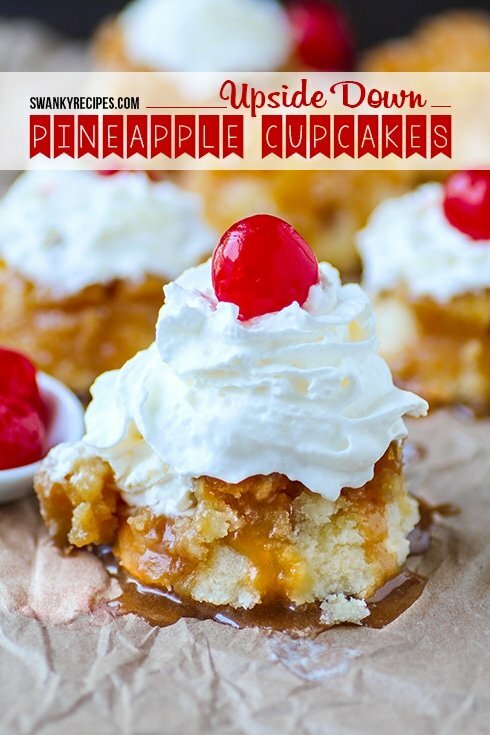 The ultimate super moist and flavorful pineapple upside down cupcakes is loaded with fruity goodness and made with real pineapple juice mixed into the batter. Pineapple chucks make the top of this cupcake with whipped cream and a cherry on top. 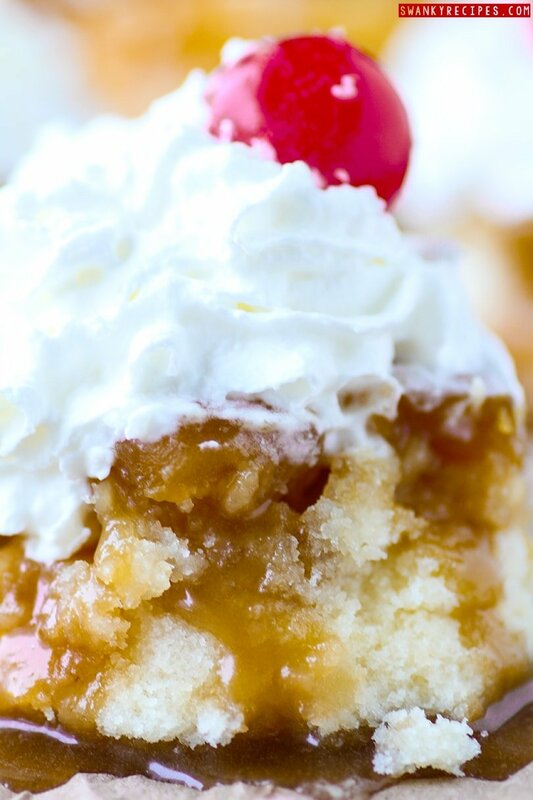 A brown sugar caramel drizzle makes this cupcake supremely moist. It wouldn’t be summer in the south without fresh Pineapple Upside Down Cupcakes. Whether you’re looking for a timeless dessert to wow guests or share for birthday party, this recipe is for you. It’s also great for summer BBQ’S, baby showers, graduations parties, summer and spring holiday parties like Memorial Day, Fourth of July, Mother’s Day and Labor Day. The classic Pineapple Upside Down Cake recipe is made into cupcakes without sacrificing any flavor! There is nothing like a refreshingly light cupcake to enjoy on a hot summer day. Everything about this cupcake screams summer and is a timeless classic recipe served in the south. These cupcakes are great to enjoy over a weekend outside reading a good book under a fan on the porch with a tall glass of iced tea. The cupcake itself is fruity without being bitter. The perfect amount of pineapple juice is added to this white cake batter. 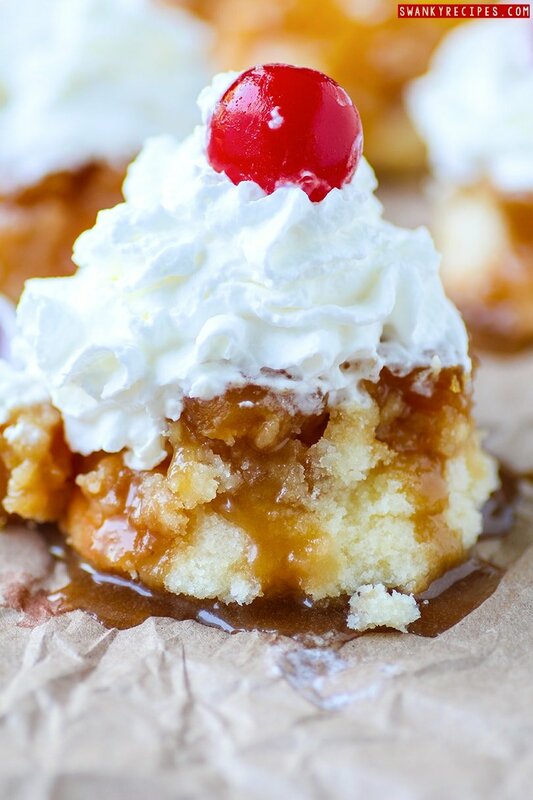 Real pineapple chunks topped with brown sugar caramel add incredible flavor. 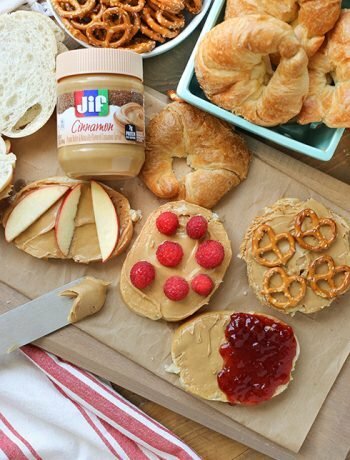 When summer parties start in a few weeks, you don’t want to be without this recipe! To make this recipe, you’ll need a few ingredients. You can use fresh pineapple or pineapple chunks. Preheat over to 350 degrees F. The bottom of the muffin tin is melted butter and brown sugar scooped into each tin. You’ll want to use non-stick cooking spray and generously spray each tin before adding anything to the tin. The pineapple chunks are laid onto paper towel and the tips slightly cut to be able to arrange 5 pineapple chunks into each tin like a flower. Without cutting the some of tip off, you’ll only be able to fit 4 in each tin and we don’t want that. 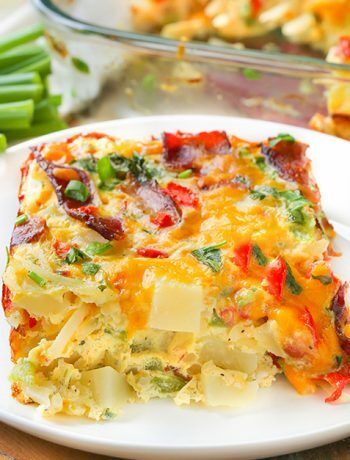 Set muffin tin aside. In a large bowl fit with a mixer, whisk together the dry ingredients. Add the softened butter and pineapple juice and mix on medium high speed for 1 to 2 minutes, until pineapple batter is smooth. Wipe down the sides of the bowl and mix until incorporated. 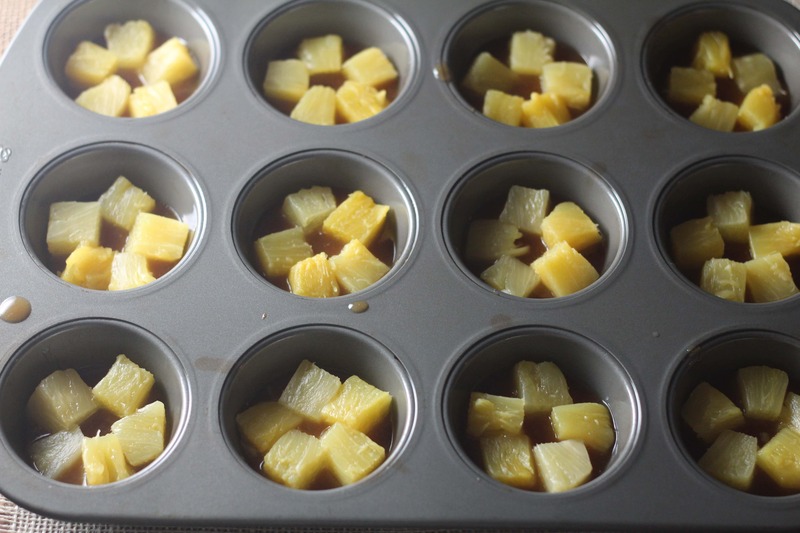 Once the pineapple batter is mixed, spoon cupcake batter into each tin equally. Bake in oven for about 23 to 26 minutes or until a toothpick inserted in the center comes out clean. You’ll want to allow the cupcakes to cool completely. Removing before they are cooled could result in the cupcake falling apart. You remove cupcake, run a clean knife along the edges and tip pan upside down to get it out. Place cupcakes *pineapple chunk side up* on a rack. I made extra brown sugar butter caramel and drizzled it over the top. Make the whipped topping and pipe it onto each cupcake just *before you are about to serve. Place a cherry on top. Store in refrigerator. 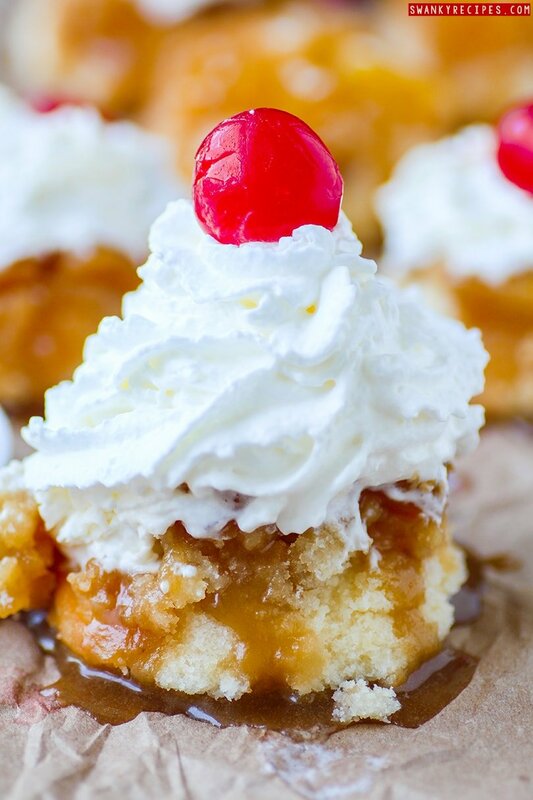 Moist, flavorful and made with real pineapple juice mixed into the batter, pineapple chunks, whipped cream, cherry and brown sugar caramel. Preheat oven to 350 degrees F. Spray 12 cup cupcake pan with non-stick cooking spray. Open both cans of pineapple chunks and drain liquid into glass and set liquid aside, this will be used for cupcake batter. Layer paper towel and spoon pineapple chunks onto paper towel. In a microwave safe dish, melt butter and stir in brown sugar to dissolve. Using a teaspoon, scoop about 2 teaspoons into each prepared muffin tin. You will want to fit 5 pineapple chunks into each tin. Since the chunks may be different sizes, I used a knife to cut the off a small part of the chunk on the long ends. Arrange in tin like a flower, repeat until done; set aside. In a large bowl fit with a mixer, combine flour, 3/4 cup sugar, salt and baking powder. Add butter and turn mixer on medium speed then pour in pineapple juice. Continue mixing until batter is smooth, about 1 to 2 minutes. Add vanilla extract and egg then keep mixing, wiping batter down from the side of bowl with spatula. Scoop batter over pineapple arrangements in tin. Bake in over for about 23 to 26 minutes or until a toothpick inserted in the center comes out clean. Allow cupcakes to cool completely. Removing too soon can result in muffin falling apart. Once cool, run a clean knife around the edges of cupcakes until it comes out. Place on rack with pineapple side up. To make the whipped topping, pour cream in bowl fit with a whisk attachment. Whip cream on high speed until soft peaks form. Add sugar and whip until cream is stiff. Assemble cupcakes just before serving. Pipe whipped cream/spray can over the top of cupcake and place cherry on top. Also, I made extra brown sugar and melted butter mix and spooned it over the top before the whipped cream was added. 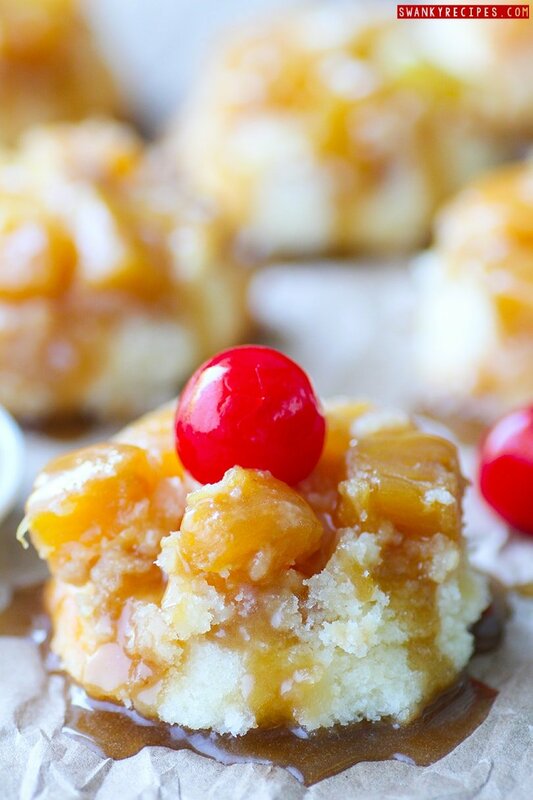 I love pineapple upside down cake and these look simply heavenly! So glad to have found you at Treasure Box Tuesday! Oh wow, these cupcakes look insanely moist and flavorful!! I haven’t had a pineapple upside down cake in the longest time…and now I’m practically drooling on my keyboard! Thanks for sharing the recipe. These look delicious! I found you at Peeled. What a great twist on a classic. I added your recipe to my Yummly! Thank you for sharing! Yum! This is a wonderful spin on a classic recipe. They look great! These looks so delicious. This is a must try recipe. Thanks for sharing it. Mmmm, these looks SO delicious! Hi Jessica, thank you for sharing your Chocolate Chip and Pineapple recipes on Friday Features this week, they look delicious. I like the way you have made these into single serving sizes! Hope you will visit often to share, we all like good and different recipes and ideas! These cupcakes are super cute. Who can resist pineapple upside down cake? I am featuring you over at Simple Supper Tuesday this week. We would love for you to join us again, starting Monday night at 8pm EST. Sounds really yummy! Great for summer entertaining. Found you at Merry Monday. What great cupcakes, we will just love your Pineapple Upside Down Cupcakes, they look delicious. Hope you are having a great day and thanks so much for sharing with Full Plate Thursday this week. Hi there, that looks so delicious, I’ll take a spoonful because I’m watching my weight. 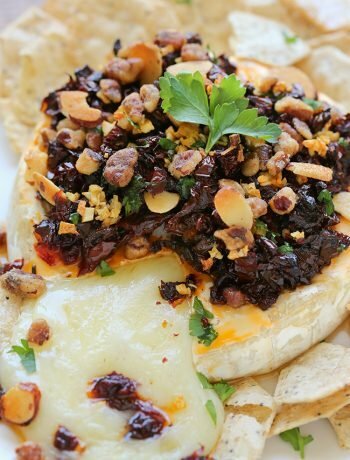 Family will love this recipe, it has so much going on! Thank you! Wow – this looks yummy !!!!! And I like the idea that they are individual sizes because as good as this looks I could eat it all LOL !!! Thanks for sharing. Visiting from Best of the Blogosphere. Thanks, Rebecca. I like to enjoy 1 or 2 here and there! These cakes look wonderful! Perfect little sized dessert for portion control too. Thanks for sharing on Merry Monday and hope to see you again on Sunday at 6pm PST. Luscious! Perfect for the summer season, a lighter but scrumptious dessert. I will be featuring this post at the new Merry Monday party this week. So glad you shared. I love this! Fancy & FUN!